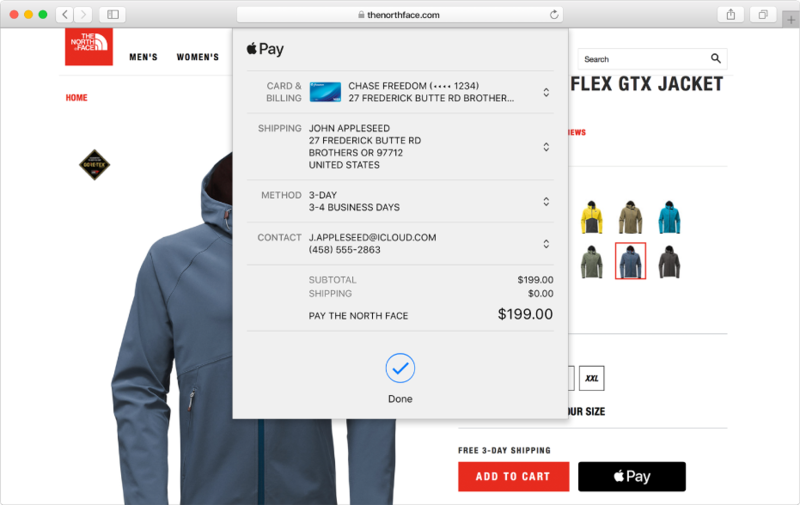 You can easily and securely shop on your Mac in Safari using Apple Pay. Look for Apple Pay when you check out, then complete your purchase using your Mac with Touch ID, iPhone (iOS 10 or later) or Apple Watch (watchOS 3 or later). If you complete your purchase using iPhone or Apple Watch, you must be signed in to iCloud with the same Apple ID as on your Mac. Note: Apple Pay is not available in all areas. Before using Apple Pay, set up your credit or debit card on the device you’ll use to complete your purchase. In the Safari app on your Mac, at checkout click Apple Pay. You can change the credit card, shipping address or contact information before completing your purchase. Mac with Touch ID: Use Touch ID. Only one user account on your Mac can use Touch ID on the Mac to complete purchases with Apple Pay. Other user accounts must use iPhone or Apple Watch. iPhone: Double-click the side button, then authenticate with Face ID on iPhone X; or use Touch ID on other models.